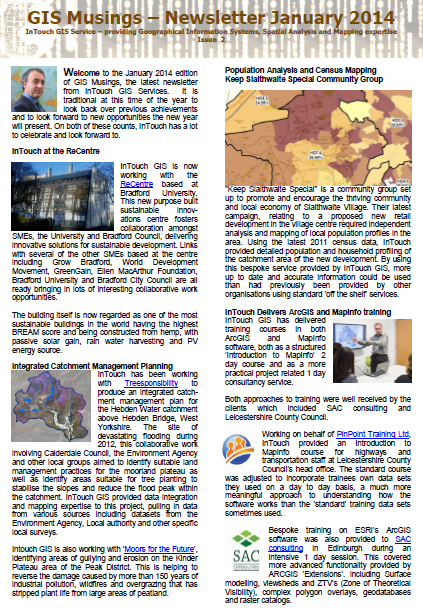 The latest newsletter from InTouch GIS Services is now available highlighting some of the work and initiatives that InTouch has been involved in during 2013 and opportunities to look forward to during 2014. I hope you find this informative and gives you some ideas of how GIS may help add value to your information. There is as usual a varied selection of articles, covering using the 2011 census and how it has been used for local community development, river catchment planning to help reduce flooding in West Yorkshire and new initiatives from Bradford University’s Recentre and the Satellite Catapult. My predictions for 2014 are that it will be a year in which “Big Data” becomes an issue for large and small organisations and which the explosion of online mapping moves in to online analysis. It will see some of the more generic information provided by the UK’s national agencies being used in more innovative ways and by organisations that have previously only considered the pure mapping and locational elements of GIS. If you want to discuss your ideas for using geographic data and mapping with your company or you just want to know a little more about GIS then please do get in touch with InTouch GIS Services.